Who needs an AdMech Light Cruiser? Yeah, AdMech got it al covered. The GZG ones, the Spartan Games ones. Probably the nicest, most detailed, most setting-appropriate out there. And probably mentioned before. Has the prow design we all know and love. Though no printed samples. Also, less detail than the first one. The designer also has a couple of other designs of smaller craft with the same aesthetic. Some cool SG Tau options here, some of the bigger ships have different modules you can swap out too. 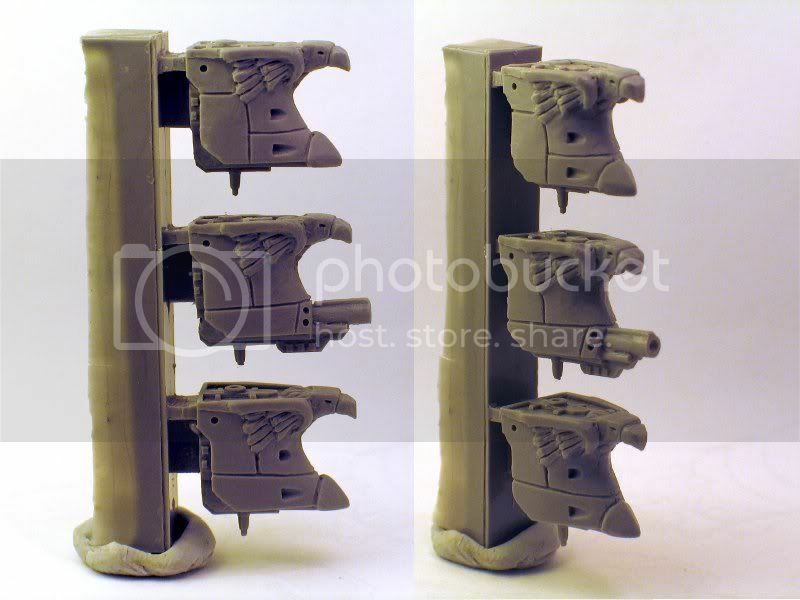 is there ANY way i could get a hold of these prows? I think you can hit him up with an e-mail I guess. He already has a store in place; shouldn't be that much of an extension to put in a custom order, I think. Never know till you ask! 12 ships for only GBP 2.55! Perhaps get a few boxes to represent different kinds of fighters/escorts. GZG IF (Islamic Federation) might make ok Necrons? Was never that keen on the original Necrons - always thought they didn't put quite enough imagination into the designs or something (e.g. just leaving it as a simple crescent?). These GZG IF ships have the same crescent theme incorporated into their design though and I think painted up in the right way they would make very good proxies, maybe even slightly more pleasing in some ways. This is seven ships from the range, from escorts to Dreadnought size, though there are more in the range and can't find pics of them all. (Edit), Last pic is one I found on the web of IF fleet and some guys lunch... ships painted in a black/silver/green theme though which is kind of what I was thinking of. Got some, the scale is wrong for BFG I think. I.e. you can see cockpits which are means a human would be 3-4mm high. They make great aircraft proxies for Epic though! Yes, I agree. I have 2 GZG fleets and both is that format. Battleships from GZG will be your cruisers. Dreadnoughts will be your battleships. Some of their escorts are too small so use the slightly larger type escorts. Cruisers from GZG make torp light cruisers. Wow, those Islamic ships seems like pretty sweet Necrons! I have no problem seeing those GZG Islamic Federation ships as Necrons for Adepticon 2014.